While we spend most of our time focusing on the cutting-edge design and performance of Audi vehicles, safety is by far the most valuable feature an Audi can provide. Case in point is this harrowing report. Last Sunday night, four people in an Audi Q5 were struck by a train in Florida. Amazingly, all four occupants survived without life-threatening injuries. 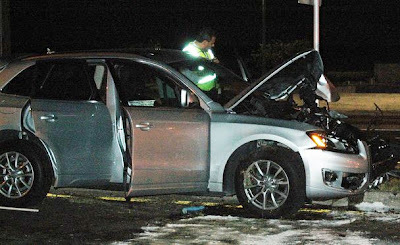 According to reports, 70-year-old Daniel Diaz of Tampa, was driving a 2009 Audi Q5 carrying three passengers aged 70, 71 and 89 when the vehicle was struck by a single CSX locomotive engine (without freight cars) at a rail crossing on Tampa Road near State Road 580 in Oldsmar, Florida. Commenting on the conditions of the victims, the driver's daughter, Diaz de Maria told the St. Petersburg Times "It's definitely a miracle." A doctor at the trauma center where the victims were taken even said he "had never seen anyone survive a train crash." Not only did these folks survive, de Maria reports that "everyone's healing. Everyone's doing pretty good." As miraculous as it may seem, this story is a real-life example of Audi's remarkable dedication to safety. Not surprisingly, both the Audi Q5 and A4 earned 2010's Top Safety Pick from the Insurance Institute for Highway Safety. There certainly is truth in engineering.